Clicker is a web TV guide that introduce about where you can watch TV programs on internet, like TV show, movie, music video. 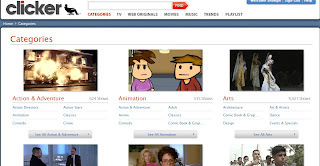 You can browse video by Categories, TV, Web originals, Movies, Music, Trends, Playlist. Each items have list, you can click a video that will display some information about that video, like resource, description. Some videos you can direct click and watch without leave site, because Clicker embeds many videos on its site, but some videos you have go to original site to watch. Most TV shows from US TV companies, like CBS, NBC, CNN, PBS, Fox. Other videos from other websites. Movies from Hulu, Crackle, Snagfilms, and so on. If you want check what is going on about internet TV program maybe this is a good guide, but some US based TV program could not be play if you are living outside of US. Clicker is beta version now, it requires invitation for register an account.